Ueno Hirokoji black market, c. 1945, looking north toward Ueno Park (top) and Ueno Station (top-right). “This is Tokyo’s Ueno, the most pugnacious part of town, where tempers and nostrils flare, and every inch of territory – even the space under a train trestle – is guarded jealously. Yes, it is just the sort of place where, not so very long ago, there was a bloody row in which the locals took on the gendarmes of the law. “It is also what comes in the wake of war and its fire: a city in ruins, the burnt-out shell of a metropolis. Its creatures have hatched out of the debris, and now they survive by the sheer tenacity with which they came in to the world and by which they cling to life. 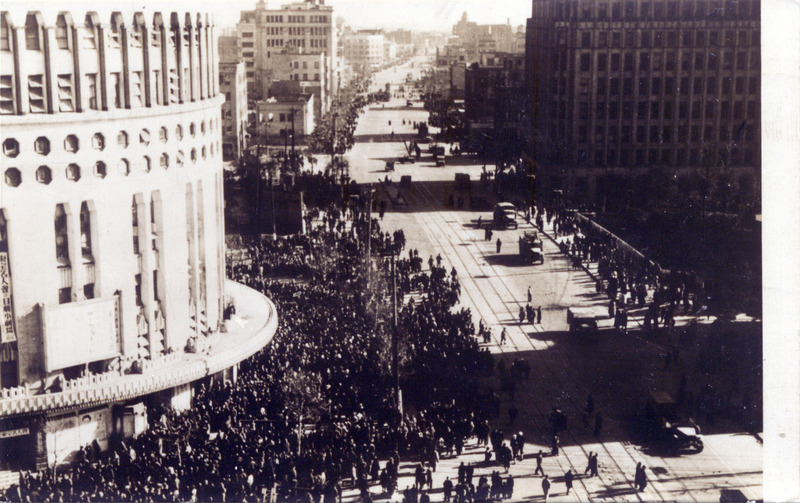 Tokyo residents line up at curbside yami ichi (black markets) at Ginza Crossing, c. late 1945 at the onset of the Occupation. 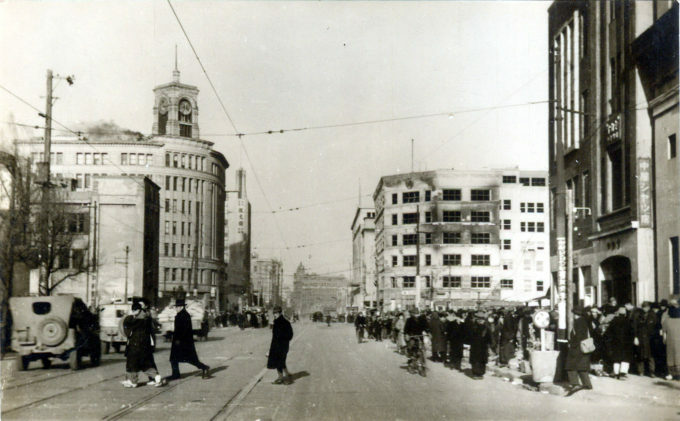 Looking northwest toward Kyobashi, with the Dai-ichi Sogo building in the distance, the Wako department store is at left, and would be repaired for use as the Tokyo PX by Occupation forces; the burned-out shell of the Mitsukoshi Ginza department store is to the right. The Ginza retail and commercial district had been firebombed in a May 1945 raid by American B-29 bombers. “Japan lay prostrate. Industrial output [in 1945] had fallen to mere 10 per cent of the prewar level, and as late as 1946, more than 13 million remained unemployed. Nearly 40 per cent of Japan’s urban areas had been turned to rubble, and some 9 million people were homeless. “… Shantytowns built of scrap wood, rusted metal and scavenged odss and ends sprang up everywhere, resembling junk yards. The poorest searched smouldering refuse heaps for castoff items that might somehow be bartered for a scrap to eat or something to wear. Nichigeki Theater customers (left) & Sukiyabashi black market crowds lining the street toward Ginza in the distance, 1945. “It was surely some kind of record for speed. Three days after the end of the war—and a full ten before the first American soldier set foot in Japan—the above newspaper advertisement appeared for what would be the nation’s first postwar black market. One of the very few paid announcements in print at the time, it was a call to commerce hardly anyone expected so quickly, given the wretched, bomb-ravaged condition of Tokyo. “For most of Tokyo’s inhabitants existence was a living hell. Homeless, numbering in the millions, lived in jerry-built huts of chicken wire, rocks, and cardboard, occupied subway stations and air raid shelters, or camped out in large bomb craters in the street. There was so little available food that people would travel hours to the countryside to trade expensive heirlooms for a tiny share of a farmer’s crop. Yet, by August 20, only five days after Japan had officially conceded defeat, the Ozu open-air market was ready to roll. “Located at the main entrance of the western commuter hub Shinjuku Station—or what was left of it—it boasted a startling array of goods. Displayed on wooden crates were pots, pans, kettles, plates, silverware, cooking oil, tea, rice, leather, electrical goods and geta (wooden clogs), along with vast quantities of military equipment and clothing. 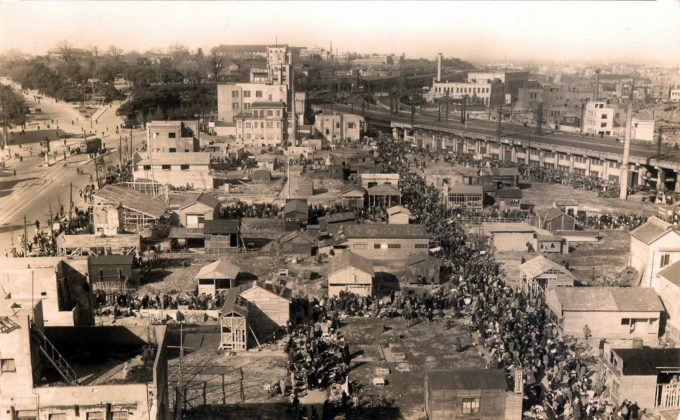 Most of the wares for the market, which bore the romantic-sounding name Hikari Wa Shinjuku Yori (The Light Shines forth from Shinjuku), had been stolen from a secret supply of provisions for a ghost army of 4 million men that was to have been mobilized in the event of an American invasion of the mainland.